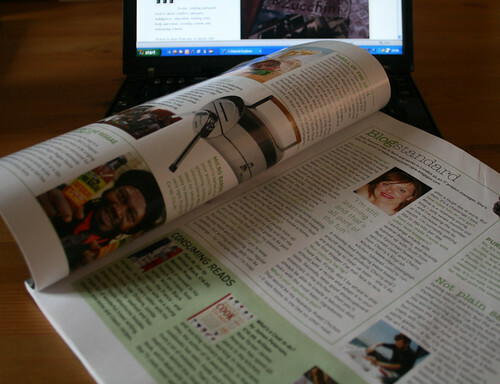 Each month Delicious magazine interviews a food blogger in their ‘Foodie File’ section. I buy the magazine each month and this is the first section I turn to, excited to see which of my fellow bloggers is featured this month. I’m delighted that, for the July edition – which is out now – the featured blogger was myself! I feel very privileged to be in such good company – previous bloggers who have been interviewed include Sam from Becks & Posh and Aun from Chubby Hubby. I’d like to extend a very warm welcome to new readers who have found ‘A Slice of Cherry Pie’ through Delicious magazine. If you scroll down the left-hand side of the blog you can view the archives, posts by category, search the blog and take a look through some specially selected highlights. I hope you enjoy reading the blog as much as I enjoy writing it.